To access our website, just click here. 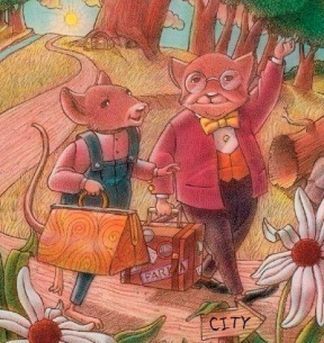 "I'll Take the City, Please"
Have you ever heard the story of "The City & The Country Mouse"? In the original version of this story, a city mouse visits his cousin who lives in the country. The country mouse offers the city cousin a meal of simple county cuisine. The city mouse scoffs at such fare and invites his cousin to visit the city for a taste of a much better life. The two cousins dine fabulously well in the city until their meal is interrupted by a couple of dogs (or cats--depending on the version). These furry friends cause our mouse cousins to abandon their meal and run for their lives. The country mouse, after all of this city excitement, decides to return home, preferring the security of the country to the fancies of the city. As a 13th century preacher, Odo of Cheriton, summarized the fable for the country mouse, "I'd rather gnaw a bean than be gnawed by continual fear." This girl, on the other hand, has a fancy for the city. Please don't get me wrong. I have absolutely no interest in "continual fear" as is expressed above. There are some who find the city brings on a bit of anxiety. I can appreciate and understand that vantage point, but I find comfort and security in the numbers. Therefore, I find security in the city. And if I scream, someone needs to hear me! These were the real house shopping rules! You see, for me, the country comes with a feeling of being isolated and, apparently, without restaurant food in close proximity, this causes me anxiety. ;) So, when we moved to the country years ago, it was not my personal preference, but I did so believing that the country life would offer my kids stability, and by moving out of the city, we could also afford lakeshore property. Raising a family on the lake, what fun! The sheer enjoyment of lake life should outweigh anything I might sacrifice from city life. What I found instead was owning two acres on the lake meant a lot of work--a lot! 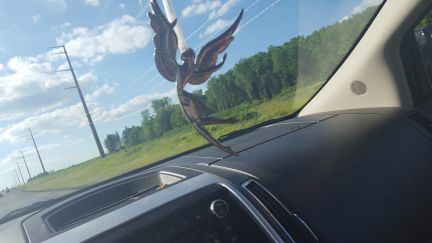 Plus with great distances between my kids and their friends, this meant much driving for mom. Neither of these two things gave me much of an opportunity to enjoy the lake. So, when my youngest left for college, I headed to the city. I live a few blocks from Grand Avenue in St. Paul. I'm a couple miles from the Mississippi, the Cathedral, Uptown, and all the BEST the city has to offer. I absolutely LOVE it! I walk or bike nearly everywhere I need to go, and I need to exercise this much because of the all the food. My gosh, the food is phenomenal. Some of the best restaurants are just blocks from me. (Yes, important criteria expressed above!) 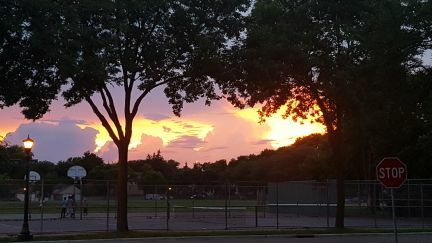 My evening walks include some of the most beautiful surroundings. I've tried to capture the pictures for you, but honestly, when I try to, it NEVER looks as good as the real, live scene. You'll just have to simply come walk with me. And the awe-inspiring majesty of sunrises and sunsets over the open spaces! Oh my gosh, do I miss the natural beauty, the sky, and the sunsets! For me, there is something so spiritual contained in the grandeur of looking up to the heavens. I've tried to find it in the city, but you have to be at the right place at the right time to catch a glimmer, and that's all you get, just a glimmer. The shot to the right was captured near Laurel and Dale, but much of the magnitude of the overwhelming beauty is tapped out by all the goings on of the city. There is absolutely no question that the county has the city beat with all the expansive, natural beauty, and even though I've moved to the city, I'm blessed that my job of teaching insurance continuing education classes brings me back to the country. I get to visit some of the BEST places throughout the entire state. 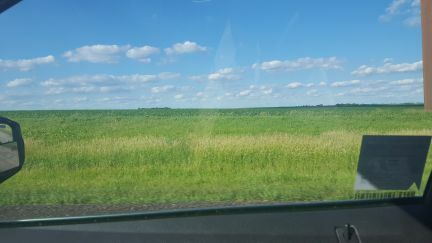 From the picaresque lakes and wooded areas like ALEXANDRIA, BEMIDJI, BRAINERD, DULUTH, DETROIT LAKES, LA CROSSE, or FOREST LAKE to the wide open spaces that surround areas like MANKATO, ST. CLOUD, ROCHESTER, BURNSVILLE, and GRANITE FALLS. Each of them offers a special beauty and uniqueness. I encourage you to pick a location you have not yet attended and check out the natural beauty along the way or contained at the destination. They are all great, every single one, and I can't wait to see you when you get there.